This is a modern cornice / pediment inscription meant to immulate its neighbor at 33 Great Jones St. (Beinecke & Co., stables). There is little of any interest here other than the peculiar abbreviation, TKGN, for the word, Trucking. 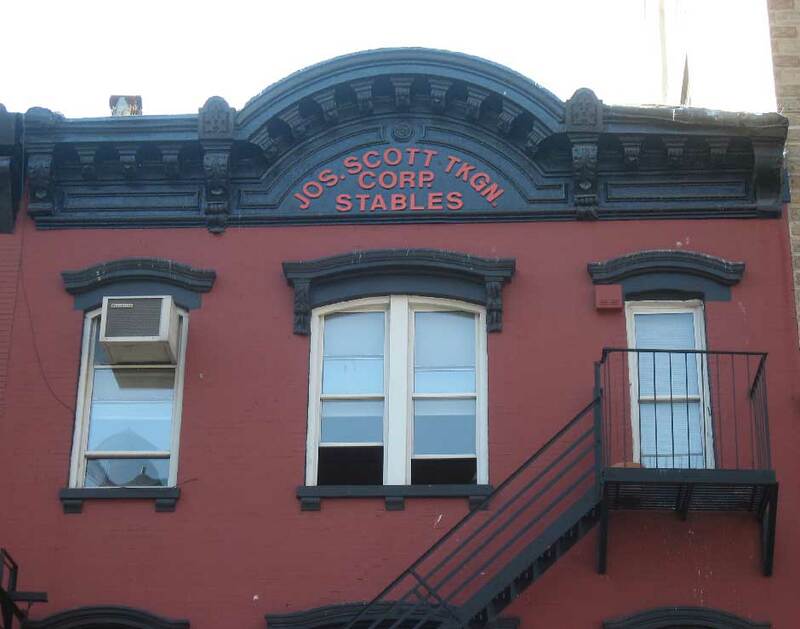 The Joseph Scott Trucking Co. was located on Great Jones St. from 1966 to 1997. Initially they were located at 59 Great Jones St., then in 1970 moved here to 31 Great Jones St. Soon after they seem to have acquired the nextdoor property, 33 Great Jones St., and were listed in the Manhattan telephone directory at that address from 1973 to 1997. A photograph by Matthew X. Klernan on flickr shows both 31 and 33 Great Jones St. and includes the following: "Though they appear almost identical and were built at the same time, these two stables have different architects and different histories. No. 31 was built for the New York Board of Fire Underwriters to house their Fire Patrol No. 2. They decamped in 1907. Since then, the building has served variously as an auto repair shop, hat factory and restaurant with apartments above at times. No. 33 was built for the Wilcox & Gibbs Sewing Machine Co. Beinecke & Co., purveyers of meats, used the building as a stable from 1890 until 1929. Their name appears in the cornice. After that it was home to various auto repair shops and trucking firms. Joseph Scott of the Joseph Scott Trucking Co. (named in the cornice of No. 31) bought both buildings in 1976." There is a photograph in the collections of the Museum of the City of New York showing the Jos Scott Trucking Co., as well as the building next door with Beinecke in the cornice. Dated ca. 1980, this is a photo by Edmund V. Gillon, Jr., who did the photographs in Margot Gayle's Cast-Iron Architecture in New York (1974).